There are many hotels in the Pelourinho, you can normally just arrive without booking and you’ll find one. If you prefer to book ahead however, most hotels offer online booking. The Pelourinho is the historic center of Salvador. It’s protected by UNESCO, additionally it’s safe to explore. In fact it was the first capital of Brazil in 1549 and remained the capital for over 200 years. 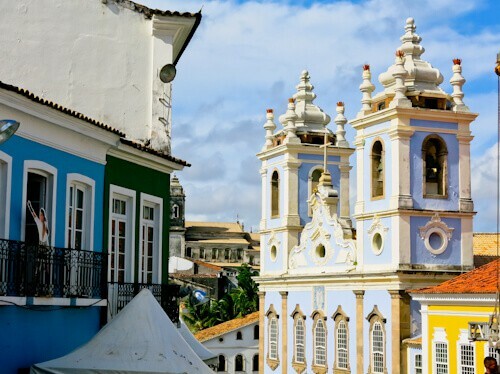 You’ll find lots of colorful, colonial Portuguese buildings in the Pelourinho. For this reason, it’s perfect for Instagram photography! Furthermore, there are hundreds of restaurants, shops as well as hotels. 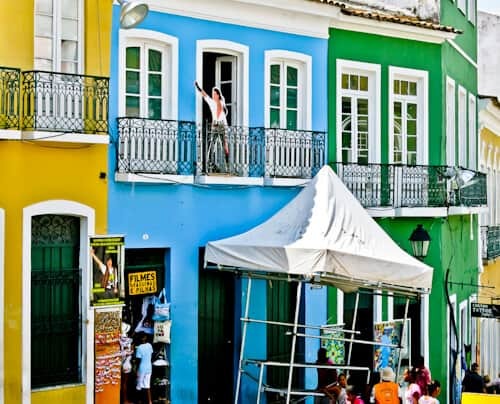 The Pelourinho is the best place to stay when you visit Salvador de Bahia. Moreover, Michael Jackson filmed his short movie, ‘They Don’t Care About Us’ at locations throughout the Pelourinho. The main reason I visited Salvador is because this is where Michael Jackson filmed his music video ‘They Don’t Care About Us’. Olodum, the band who feature in his music video play live in the streets of Salvador free of charge, at least once a week. Ask in your hotel when Olodum are performing. If they’re performing, the most effective way to find them is by following the music. The drums are loud, as a result the whole Pelourinho can hear them! 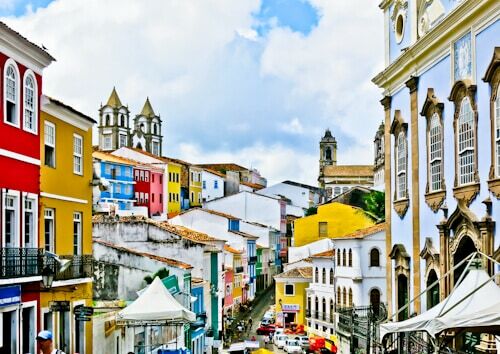 Salvador is famous for learning Capoeira, the Brazilian martial arts dance. Check in hotels and restaurants around the Pelourinho for any adverts for Capoeira classes. If you plan on staying in Salvador a while you could also take Portuguese classes. 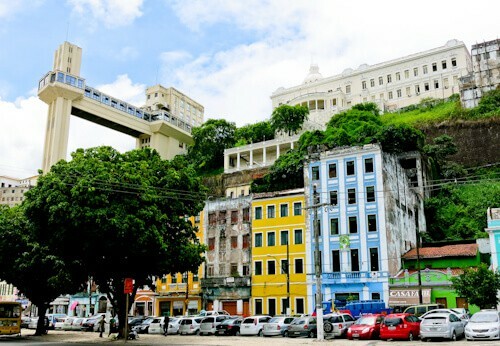 The Lacerda Elevator connects the upper part of Salvador (Pelourinho) with the lower part of the city. You can walk up and down or take the elevator. The panoramic view from the top is amazing, you can see out over the ocean and beach. Additionally, there is a plaza at the top of the elevator where you can watch people performing the Capoeira dance, a tip will be expected. 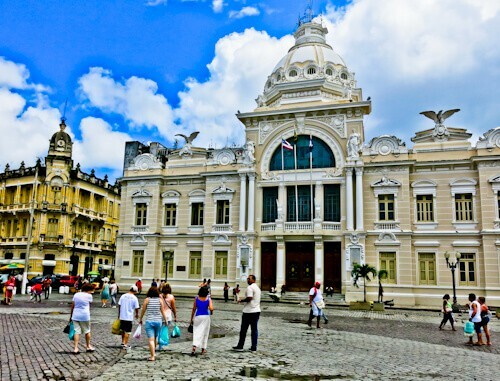 Rio Branco Palace and is also located on the plaza at the top of the elevator, the model market is located at the bottom of it. The Rio Branco Palace is one of the oldest palaces in Brazil. 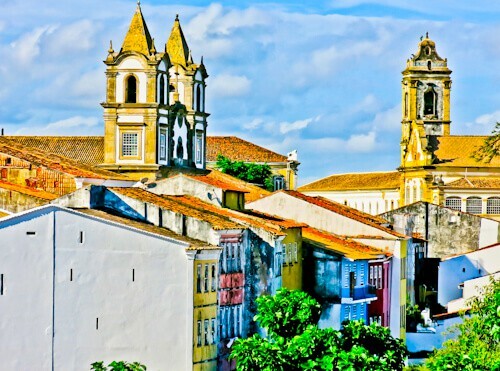 It dates back to the 16th century and was the home of the government when Salvador de Bahia was the capital of Brazil. The building was bombed at the start of the 20th century. It has since been restored and named in honor of the Baron of Rio Branco who is considered to be the father of Brazilian diplomacy. Furthermore, the architectural style is Neoclassical. The Mercado Modelo is conveniently located next to the cruise port. Not only do they sell locally made arts and crafts but they also sell clothes and other typical market items. It’s definitely worth a walk through to check out what’s going on in there. Importantly, the market photographs beautifully from the top of Lacerda Elevator. If you watch the Michael Jackson short video, you’ll see him singing on a balcony. This balcony and Michael Jackson store is located in the center of the Pelourinho opposite the blue catholic church. It’s possible to pay a few dollars and stand where Michael Jackson did on the balcony. In addition, you can buy photos and souvenirs of Michael Jackson in the city. You can even buy replicas of the clothes he wore throughout the short movie! Church of Nosso Senhor do Bonfim is a catholic church but also incorporates Candomble, a religion from Africa. The Portuguese brought many slaves to Salvador de Bahia, for this reason there is a lot of African influence. Candomble actually means to dance in honor of the gods. As we know from Capoeira, OLODUM and Michael Jackson, Salvador definitely dances in honor of the gods! The blue catholic church in the Pelourinho is stunning. It’s a Brazilian / Portuguese version of the Blue Church in Bratislava, Slovakia. Directly opposite the blue cathedral is the balcony where Michael Jackson performed during his music video. The official name for the blue cathedral is Igreja de N. S. do Rosario dos Pretos and it was built in the 18th century. I stayed in the Hotel Pelourinho, which you can see clearly in the Michael Jackson video when he’s dancing on the streets. It’s not a great hotel, I only stayed there because Michael Jackson was singing and dancing right outside it in the video. Nonetheless it’s an iconic hotel! 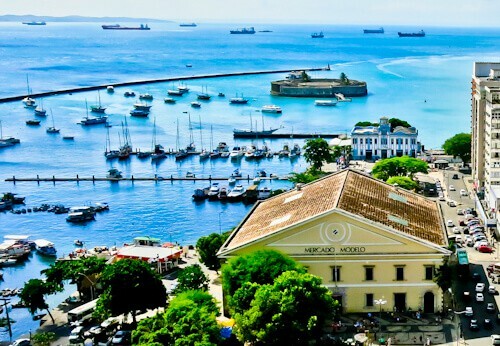 A good way to see the sites of Salvador de Bahia before visiting is to watch the Michael Jackson short video. 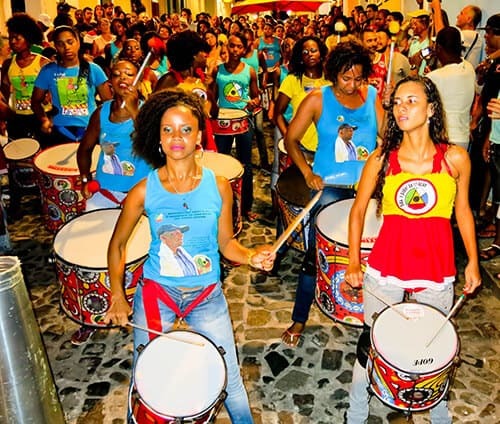 Furthermore, you can experience the carnival atmosphere which OLODUM bring to Salvador. 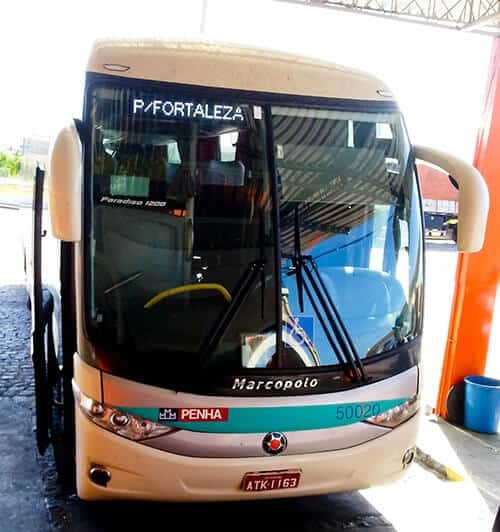 I took the Penha bus service from Salvador to Fortaleza, this was a 21 hour service, and the bus was again luxury with plenty of legroom as well as movies (in Portuguese). 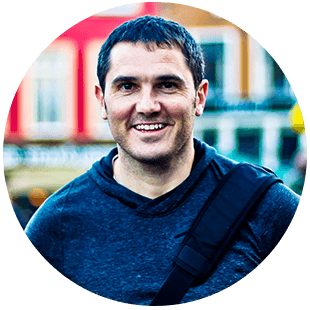 I’ve been following your Latin American travels on your blog and all your blog posts are quite fascinating. What a song They Don’t Care About Us is. And it’s amazing the band play on the streets at least once a week. Taking a Capoeira class while based there sounds quite fun, too. I love to learn new things while I travel. 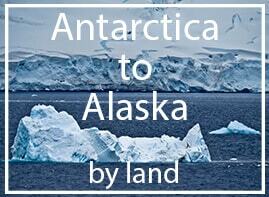 That’s one more UNESCO site from your blog! The Blue Cathedral looks fantastic! I’d love to visit Brazil for the huge statue of Jesus at Rio. Also seeing OLODUM at Salvador would be awesome! What a cool place to go back to, where MJ filmed that video! That’s a great reason to want to go! Really awesome place, by the sounds of things. I’d definitely love to see the Blue Catholic Church. And I’d totally sign up to learn Capoeira! I had no idea that there was a connection with Michael Jackson! How awesome! The Pelourinho is beautiful. I definitely want to visit! I also like the ‘They Don’t Care About Us’ of MJ. When I listen to it sometimes, it uplifts my spirit immediately. It was so cool that you visited Salvador. I know what is a Capoeira but I have not tried it yet. The church looks really beautiful. I do remember that video from MJ – it is a nice trivia you shared here. I didn’t know this music video was shot here. Nonetheless, it was very interesting that you got to visit and explore this city. I love the vibrant colors and the beautiful architecture. This post has me curious about Brazil and I think I definitely should book a trip there soon! We are heading to SA soon and will have to add this to our list because I’m a big MJ fan! So cool you were able to visit the same spot the music video was filmed. Would definitely be interested in taking a Capoeira class too! Thanks for sharing. I liked the combination of old heritage and modern pop-culture in this post. Haven’t been to Brazil but more I see of it, more interested I become. I should start planning I think. I love this small guides you keep publishing on how to travel between two destinations (Often in 2 different nations) . I love long bus rides and I hope I can repeat your experiences. The cathedral looks amazing. This post reminded me of Michael Jackson’s visit to India in 1996. I had google all those videos, brought back some nice memories from my childhood. Love the song, They don’t care about us. I have been to Brazil a few months ago but only to Sao Paolo. 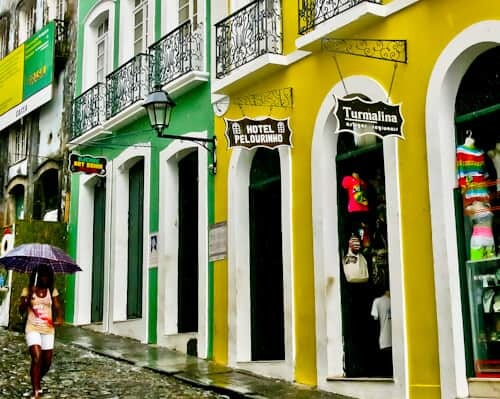 I would love to explore more and Salvador looks like a great place to experience the culture of Brazil (and learn Capoeira of course). I can’t say I am a fan of Michael Jackson so I didn’t know that this is where he filmed one of his videos. It’s great when you get to step on the same stones as your idol did years back. Wow both cities look amazing. Brasil must be a super exotic destination. The colours of the church look so bright. And I would definitely do a Capoeira clas.. Never tried it so far. Really?! That’s where Michael Jackson’s video “They Don’t Care About Us” took place? Now, I’m adding it in my bucket list! I wouldnt care if I need to pay for $5 to have a photo on that balcony! I love that song and it still gives me goosebumps watching it. I would love to see the band play too. Aside from that, I am very interested about the culture of the Latin America. And this post gave an additional excitement to visit those countries! Thank you! What a great tidbit re the band from the MJ video! And cool that they play for free once a week. The Blue Cathedral and the elevator offering views from above both look great too. Hopefully I will visit for myself one day! Had no idea about Michael Jackson music video … the place looks steeped in culture, color and tradition..would love to visit someday !! Good to know that local transport is luxurious and quite good. The church building is gorgeous with blue colour. I won’t fine something like that here in England. You are right, the blue catholic church in the Pelourinho is stunning! Salvador. Pelourinho in general looks like a gorgeous city to visit. I had no idea that Michael Jackson’s music video “They Don’t Care About Us” was filmed in Salvador. Would be amazing to trace the steps of his music video. Thanks for sharing. Maybe someday I will go. I have never been anywhere in South America yet, let alone Salvador, Brazil but I’m still kicking, so there is hope! Your pictures are beautiful. I loved the Michael Jackson video filmed in the Pelhourinho and the band OLODUM. Salvador looks like a striking city regardless. What a great idea! Combining your love of travel with your love of music! The city looks amazing btw…and that church is just beautiful! Would love to see it one day. Thanks for sharing! That was a great MJ video. Classic. I didn’t make it to Salvador on my triip to Brazil last month but I’m definitely thinking I need to go back. Yup! I would pay the $5 to have my picture made on the balcony! I had no idea where the MJ video had been made. Makes for a great travel story! The song and dance simply adds to the vibrance of Latin America. Loving the updates of Brazil on your blog. The cathedral looks classic! 🙂 What fun it would be to enrol in the Capoeira class! 🙂 Happy traveling! Brazil ???????? is next in my list to travel. Thanks for adding to my intrigue and look forward to read more about South America from you, keep exploring !